Despite continuing perma bearish diatribe of why the stocks bull markets demise is always imminent, instead the general stock market indices such as the S&P have been setting new all time highs with the Dow set to imminently make its next all time closing high that follows on strong corporate news from the tech giants such as Apple and Facebook. Facebook - Revenues surge by 72% for Q1 2014 to $2.5bn, with quarterly profits climbing to $642mln from last years $219mln. Apple - Blasted through clueless mainstream analyst expectations that were warning of Apple's 'long winning streak being in jeopardy' (WSJ), by posting record revenues of $45.6 billion, and profits of $10.2 billion. Apple also announced an additional stock buy back programme of £30 billion and an 8% increase in its dividend. However, where the prospects for the Dow are concerned the announcement of a 7 for 1 stock split now sows the seeds for this highly profitable tech giant to enter the DJIA 30 index because the Dow is a wholly price weighted index so the Apple stock trading at $524 would have had a huge impact on the Dow index when compared to other components such as Cisco trading at $23.50 or Exxon at $100. Whereas a 7 for 1 stock split would now re-price an Apple share price from $525 to $75 which would make it 'fit' the index in terms of price weighting. Therefore Apple looks set to continue to feed the Dow's exponential growth spiral that will continue to leave the clueless perma-bear crowd foaming at the mouth as the DJIA continues to set a series of new all time highs as it continues to perpetually ditch dieing corporations and industries for the new fast growing corporate giants. The subsequent price action closely matched my trend expectations as the Dow bottomed at around 15,250, and then began its volatile climb to set a new all time intra-day high on 4th of April 2014 at 16,631, just failing to break its closing high of 16,577 of 31st December 2013 by 5 points (16,573). 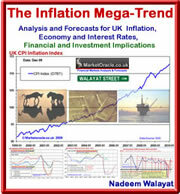 My next in-depth stock market analysis will follow early May 2014, following the completion of my latest ebook in the Inflation Mega-trend series by the end of this month. Ensure you are subscribed to my always free newsletter to get BOTH in your email in box. how can you comment the rise in profits for Facebook. Your previous article was very skeptical on the future prospects and share prices. Why can't I comment on facebook results? and yes I remain skeptical about facebooks longterm prospects because they just wasted $2 billion on oculus rift. Which I have used and it is blurry, low resolution crap that is not worth $2 million let alone $2 billion!